It's been a decade since the last Star Wars movie, and three years since Disney acquired Lucasfilm and spearheaded their plans for a new sequel trilogy. In what is officially one of the biggest releases of all time, The Force Awakens has finally arrived in cinemas - greeted with record breaking ticket sales and acclaim from fans and critics alike. Safe to say, it meets most expectations. Taking place thirty years after Return of the Jedi, The Force Awakens sets up a new story where Luke Skywalker (Mark Hamill) has fled into exile when his attempts to rebuild new Jedi order only lead to the eventual revival of the dark side, now dubbed The First Order. 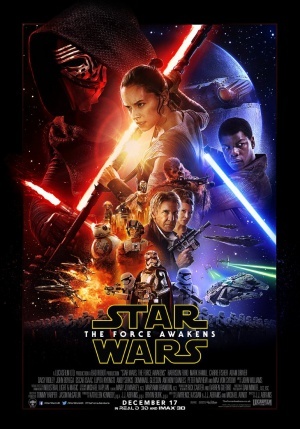 Under the command of the ruthless Kylo Ren (Adam Driver), the First Order seeks out a map that will lead them to Luke in order to destroy the Jedi for good; their efforts are combated by scavenger Rey (Daisy Ridley) and redeemed Storm Trooper Finn (John Boyega), as well as a few familiar faces of the past, and the freedom fighters known as the Resistance. J.J. Abrams has done a masterful work with the Star Trek franchise's resurgence - so he was evidently the perfect man to helm this project. The Force Awakens is full of the trademark features that we expect from the series, notably the classic scrolling credits intro with John Williams' iconic music, as well as plenty of new ideas to inject fresh energy into the overall narrative. It admittedly gets off to quite a bumpy start, mainly due to some vague exploration of backstory and unexplored character motivations, but this is quickly redeemed by some thrilling set pieces and a welcome sense of fun. Whilst there are times when humour is poorly timed, given the context of the scene, there's still no moments of it veering into dull, gritty territory - which is the best way to go. The cast is generally spot on, especially Harrison Ford in his return as Han Solo, as well as Carrie Fisher as Princess Leia. However, let's focus on those new arrivals - John Boyega helps Finn to become a likeable and charming character, but admittedly of his initial motivations aren't explored in the level of depth they really deserve. As a result, some of his behaviour is strangely segue given his apparent inner struggles; while he is entertaining to watch, his development isn't perfected in the way it should've been. The same goes for Daisy Ridley as Rey in a sense, as while the character is likeable, fun, charming, and definitely entertaining in the film's numerous battle scenes, she's just not quite as refined in terms of her backstory and general motivations. But rest assured each of these characters, no matter how much room for improvement there always is, are worthy assets to the film that each have their own loveable perks and characteristics. A worthy antagonist rests with Adam Driver as Kylo Ren who, while again having some moments of unaddressed development, proves to be a disturbing yet epic foe, complimented by a suitably sinister design and some fantastic emotional acting provided by Driver when truths are revealed towards the films climax. 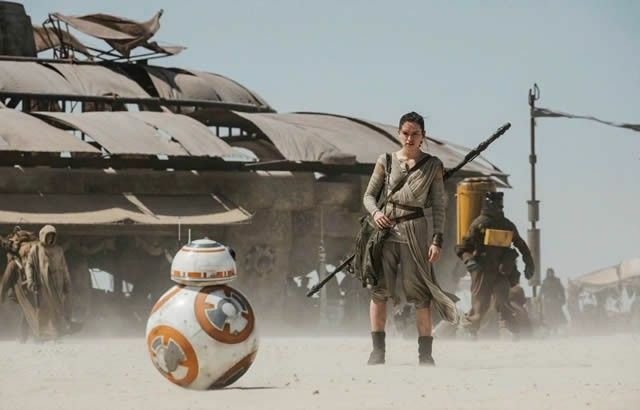 For me personally, another scene stealing role was interestingly all in the hands of an ingenious effects team - that of BB8, a droid who plays a crucial role in the overall storyline. Loveable, cute, and often quite funny, BB8 is a thoroughly entertaining sidekick with a design (built and used for the film, no CGI) that is both innovative and unique, and makes for one of the most endearing robotic characters in the entire franchise alongside the ever amazing R2D2 and C3PO. The Force Awakens is well penned by all those involved, with a story that unites age old concepts that the franchise was renowned for and injects them with a fresh feel and some new revelations. In hindsight, when watching for the first time, you begin to see just how bad George Lucas was at writing dialogue in his screenplays for the prequels - overly cheesy, borderline laughable dialogue is seldom present, and it's much easier to engage with emotionally stirring scenes, moments of genuine humour, and epic exchanges during battle sequences. More effort could've been made when it comes to character development of the new arrivals and some abrupt tonal shifts, which seems to be a common blockbuster problem nowadays, but The Force Awakens remains a stellar and exciting sequel that is more than a promising start to the next stage of this franchise.